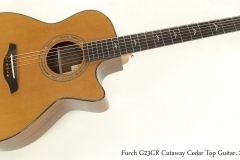 Furch guitars, formerly branded as Stonebridge after the Charles Bridge in Prauge and built in the Czech Republic, are based on designs by Frantisek Furch. A few years ago, Stonebridge Guitars International became the marketing and distribution company, and the guitars themselves were re-branded as Furch. Furch offers a wide range of body styles and wood options, and seems to focus on allowing the customer to customize, rather than making specific models with minimal substitutions. In effect, it’s almost entirely what others call their Custom Shop. 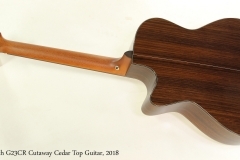 As is identified on the label as a Furch G23CR Cutaway, this breaks down to Grand Auditorium body shape, style 23, with American Red Cedar top, Indian Rosewood back and sides, and a Cutaway. The neck is Mahogany, with Ebony for the fingerboard, bridge, and headplate. The top sports an Abalone rosette, and the body is bound with a faux-tortoise strip with white/black/white/black purfling, and single line white purfling on the sides, back and center strip. The fingerboard inlays are a simple floral motif. It’s very tasteful and elegant. The finish is gloss and very clean. This example was built during 2018 at the Furch shop in Velke Nemcice, half an hour or so south of Brno in the Czech Republic. It is in very good condition with only the very slightest wear, and has the full, rich and complex sound that the Grand Auditorium delivers. The original Hiscox hard shell case is included.